We contacted the owners, and presented them with the thought of using the land very differently. They liked our ideas about turning it into an urban garden instead of a parking lot. When we showed them our existing track record and the multitude of benefits of an urban garden in that area, they were rightfully impressed. Jack McGleevey and his wife Jess, along with their two children, Brandon 8 years old and his sister Emily 6, were already active in the civics of Irvine. When we approached them with the idea of a garden and gave them our mission statement, they generously donated the land to Cross Irvine Community Church. Although we are a Christian based church, all are welcome to participate in the garden projects. What better place for every faith and nationality to grow than within the confines of a vegetable patch? Just as God made a variety of foods to feed us, we cultivate relationships with a variety of His children. We often partner with neighborhood congregations and non-profits for start-up costs, and to get the word out to the locals. We work on many different levels, and in many ways the garden makes for fertile ground. Serving this and other communities never ends, and the garden is a center piece for other good works. We have discovered that people while working in the soil have their hands in other projects that nurture the community as well. When drawn together in a common cause, like growing food and all the ramifications that go with that, we notice the growth seems to have no bounds. Last year in one of our gardens not far outside the affluent town of Irvine, there was some serious vandalism. At the time is was suspected that a group of rowdy teenagers decided to have some misguided fun at the expense of the vegetation. Apparently, late one night they plowed through on their motorcycles hopping from bed to bed until being chased by several neighbors. It didn’t take much to figure out who was responsible and bring them to justice. The justice requested was to put them to work paying for, rebuilding, and spending the next 8 months tending the garden as civil servants. Justice could not have been better served and although at first it appeared to be a big loss, in the end the win was worth it. Several of the kids are still with the Cross Irvine urban garden projects, while a couple of the others are working at the teaching farm with adolescent kids. The Lord works in His own way. We may have never reached these unruly teenagers any other way. Today I am blessed to call them friends. The garden and the communities are blessed to have them with us as part of our team. 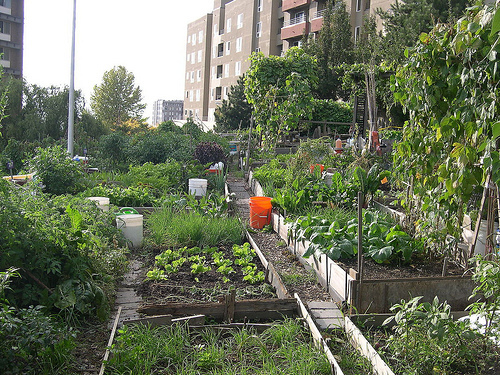 Does your community have an urban garden? Would you like information how to get started? Leave a comment in the section below. We would love to hear from you.